MDC Alliance presidential candidate Nelson Chamisa yesterday claimed that they he had met Sadc and the African Union (AU) officials to register his displeasure over poll irregularities, and assured them that he would not boycott the elections although the ground was uneven. 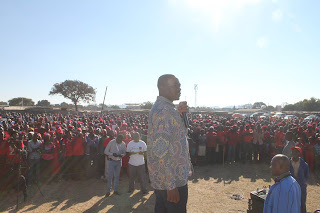 Addressing scores of party supporters at Garwe Stadium in Chivhu, Chamisa said: “The reason why I am late (to the rally) is that I was engaging the Sadc and AU over irregularities ahead of the polls. I even told them that [President Emmerson] Mnangagwa will not get 25% or 20% of total votes. We will not boycott the election. I know all their tricks to bring in fake ballot boxes,” he said. The MDC Alliance is currently pushing the Zimbabwe Electoral Commission (Zec) to be transparent on ballot paper printing, among other demands. “It is not going to happen (election). You won’t threaten or harass me. I am like a tick, if I bite I won’t leave. I have told Sadc and AU that there is a misfit in the country. The process by Zec to print ballot papers is disputed,” Chamisa added . The youthful leader said his move was triggered by Mnangagwa’s refusal to engage all parties for a dialogue on how to move the country forward. Chamisa’s assurance that he would not boycott the polls came amid reports that he had told other MDC Alliance principals on Tuesday that he was now considering the option given Zec’s intransigence. The youthful opposition leader also hailed the army for pledging to respect the country’s Constitution and not to involve themselves in partisan party politics.